Nelson Aconite 30c is a natural homeopathic remedy made using aconitum napellus, commonly known as wolf's bane. 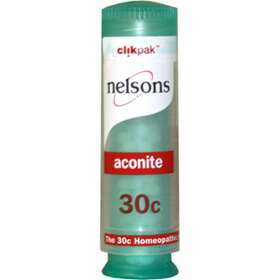 Nelson Aconite 30c is indicated to help shock, influenza and fevers. Press base twice to release 2 Nelson Aconite 30c pillules into cap. If you forget to take this product, continue to take your usual dose at the usual time. It does not matter if you have missed a dose. Do not take a double dose to make up for a missed dose. If you take too much of this product, speak to a doctor. If symptoms worsen or persist for more than 7 days, or if you experience any unusual or unexpected effects, speak to your doctor or homeopath. Nelson Aconite 30c contains lactose and sucrose. Aconitum Napellus 30c, Lactose, Sucrose.